Some of Samsung's apps feel like an afterthought; something it develops simply because there should be a Samsung version of one app or another on Samsung phones. The browser isn't like that. It gets regular updates, and people seem to actually like the app. Even folks with non-Samsung phones use it. Samsung Internet is getting an update today that brings some new features and expands support to more phones than ever. The new stable build of Samsung Internet is v6.2. That's the version that has been in beta testing recently, but there are a few features introduced in the final release that weren't even in the beta. Here's the gist. Samsung Internet is based on Chromium, but there are additional features and styling layered on top. You can sync your bookmarks from other browsers now, including your desktop with a handy Chrome Extension. 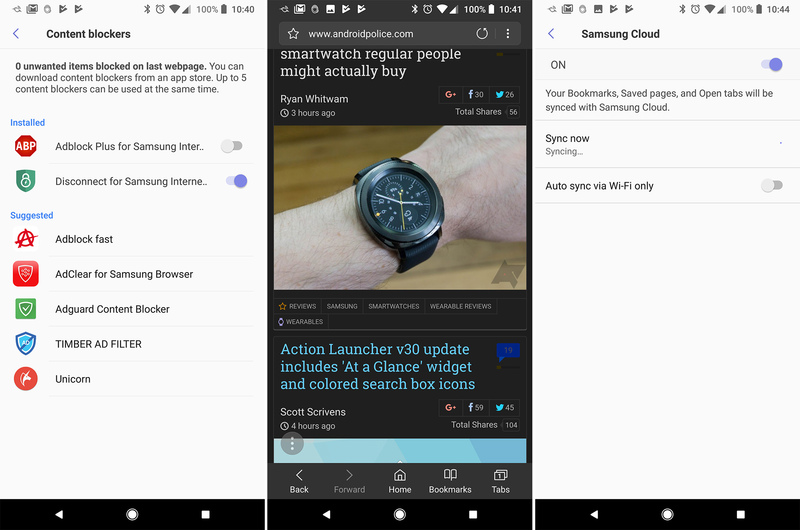 The app is also based on a newer version of Chromium (v56), and the Samsung team regularly contributes code to the Chromium project. Night mode and high-contrast modes are available in this version. Night mode is in the quick access menu, but high-contrast mode is in the settings. The content blocking features are also tucked away in the settings. You'll need add-ons from the Play Store, which isn't now. What is new is that you can easily toggle modules on and off. There's also a new tracking blocker extension from Disconnect Inc included. The new Samsung Internet works on Android 5.0 and higher. You can also use Samsung Rewards to earn points by browsing. In the US, Samsung Pay is supported in the browser, but don't expect to see many sites using it right off the bat. The new version is live in the Play Store, as well as on APK Mirror.